Get ready for Halloween! If you were wondering what was the BIG DATE for San Pedro's biggest Halloween Bash - It's October 25th. 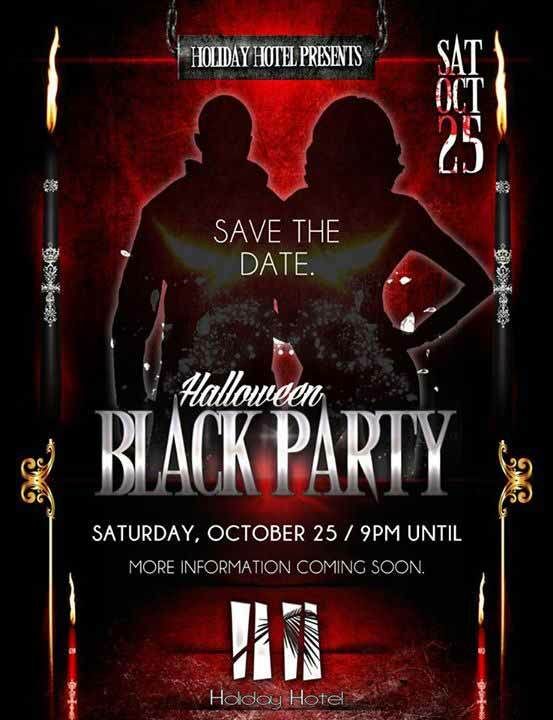 Get your costumes ready for Holiday Hotel's Halloween Black Party. Who's got their costumes already? After dinner at Blue Water Grill, tacoboy and I were both feeling pleasantly stuffed and like we were not going to last long at the Holiday Hotel party. As it turns out we did not get home till after 2:00am. After dinner, our evening was delayed by watching the UFC fights and drinks at Lola’s. By the time we got to the Holiday Hotel, the red carpet grand entrances were done but the party was still packed and going strong. Everyone knows there is no spookier way to spend Halloween than the Holiday Hotel party. I think they were smart to get the jump start on the parties by holding it the week before. Tacoboy wondered if that would cost them turnout, but I knew that this was always the “must do” party. I will say, however, there were more people without costumes this year that came to checkout the action. For those that did opt to dress up, many went all out as usual and there were some great group costumes. My favorites were the shark week girls and the Lego boys. San Pedro’s biggest Halloween party of the year. Well…human party. Saturday night the adults partied until dawn (or very close to it) and then Sunday afternoon, the pets and the kids dressed up for the SAGA Humane Society Party that may have been the biggest yet. I posted lots of gorgeous pictures yesterday (taken by Steve of Lola’s Pub) at the Holiday Party and there are lots more. SO many good ones. This is my hardest assignment yet! Here is Part Two. Who said Freedom and Islamic Terrorists can't just get along?! I submit the photo to the left as evidence that Freedom and Islamic Terrorists can in fact get along...a lot of rum really helps to expedite the process, but it did work none the less. So - Holiday Hotel Halloween Bash 2014...what a good time! This party is quite the staple in the lives of those on the fabulous Ambergris Caye. People from all walks of life, that one doesn't usually see around town (such as Hitler) just hanging out and having a good old time. Anyone who knows me, knows that while I'm not a big 'dress up' kinda guy. I am a fan of looking like a moron just for the hell of it. It may not be Halloween just yet, but the Holiday Hotel in San Pedro, Ambergris Caye, Belize, decided to celebrate one weekend earlier on Saturday, October 25, 2014. It is definitely the biggest Halloween celebration on Ambergris Caye, (probably in all of Belize) as hundreds flocked to the popular venue in costumes to celebrate. The black carpet was rolled out once again for the huge crowd of spectators outside of the Holiday Hotel to come enjoy all the great costumes as people walked into the party.